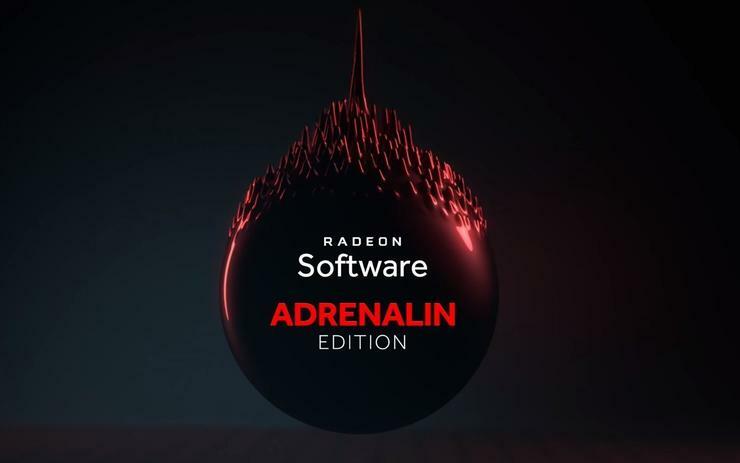 AMD’s Radeon Software Adrenalin Edition is a rocking piece of software for AMD graphics card owners. It lets users tweak their gameplay experience by adjusting game and display settings, including the ability to overclock your GPU in certain games and not others. It’s a neat piece of desktop software that can also record gameplay with a feature called ReLive. 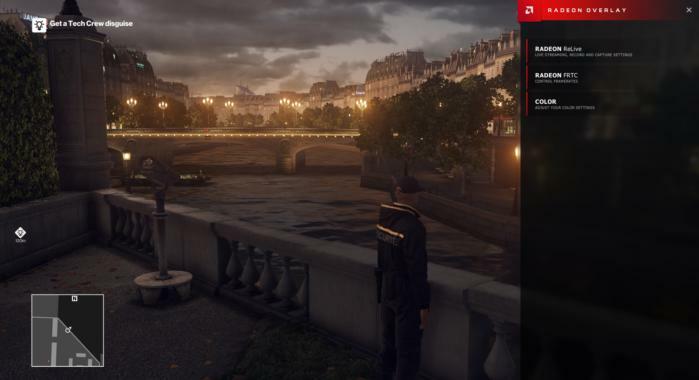 The central starting point is on the desktop with Radeon Software, but to record while in-game, access the Radeon Overlay by hitting Alt + R, or just start recording by hitting Ctrl + Shift + R.
ReLive settings in the Radeon Overlay. Contained within the Radeon Overlay are a number of other features, including in-game live performance monitoring that displays a veritable smorgasbord of data for hardware freaks. It also contains a switch for Radeon Chill (AMD’s super-smart power saving and cooling software), as well as controls for frame rates and color. The Radeon Overlay is available on the Windows desktop as well as in-game. Going back to ReLive, the feature can record gameplay for posterity, stream it to the world, or grab a screenshot. ReLive streaming integrates with Twitch, YouTube, Facebook, and Microsoft’s Mixer, as well as Stage Ten and Sina Weibo. That’s quite a wide range of online streaming platforms to access and should cover the needs of most people. 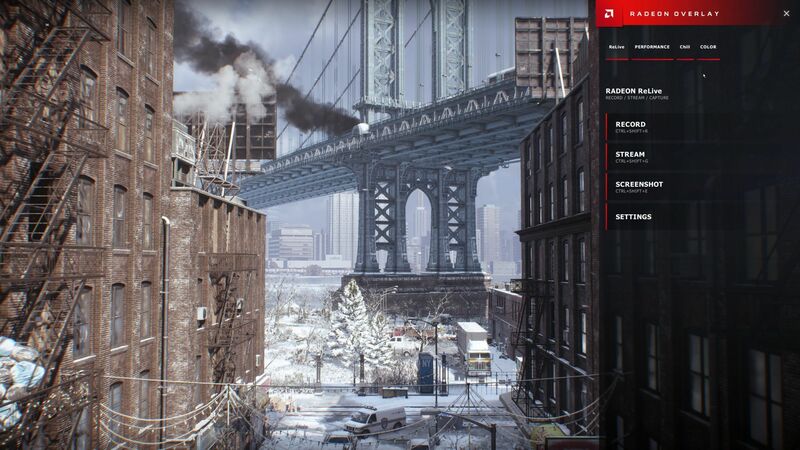 By default, ReLive records at the in-game resolution with a maximum 60 frames per second. That’s adjustable, however, as is the encoding (AVC or HEVC). For anyone who doesn’t want to do a straight-up recording all the time, ReLive includes an instant replay feature that, by default, will save the last minute of gameplay when you press a hotkey. This setting is customizable up to a full 20 minutes of gameplay, though I’d suggest five minutes or less is ideal for most games. Instant Replay is easily one of the best features of any recording software since it lets gamers save a key move, goof, or bug after the fact. ReLive also doubles as a video capture tool for the desktop to create how-to tutorials or just to show something off. ReLive will fail to run, however, if a browser is displaying protected content such as a Netflix stream. Even if the tab is open but not visible, ReLive will refuse to work. Trimming a video in Radeon Software Adrenalin Edition. To stop recording, hit Ctrl + Shift + R again. Recordings are then accessible in the videos folder in Windows or via Radeon Software Adrenalin Edition under the Connect tab. Within the desktop software users can play, share, and even trim down videos for minor edits. ReLive is very simple to use and only requires that users turn it on within Radeon Software under the ReLive tab. For those who want to tweak the settings, however, there are a few things of note. Under ReLive > Recording, as I previously mentioned, the recording frame rate as well as the encoding type are adjustable. On top of that users can set the maximum recording bitrate, and the audio bitrate. There are also settings to separate the microphone track from the rest of the recording–not to mention turning on and off the microphone for recording in the first place. Under ReLive > Overlay users can also activate the webcam settings for streaming and recording. Radeon Overlay’s primary menu with performance monitoring option missing. Similar to other benchmarks for recording software, we used a test rig with constrained resources—the point being to see how the software performed in less than ideal conditions. Overall, activating ReLive dropped the average frame rate by a small but noticeable 5 to 10 frames per second in each game. That’s about the same as we saw with Nvidia’s ShadowPlay, built into the company’s GeForce Experience software for GeForce graphics cards. The biggest drop was during the Metro: Last Light Redux benchmark at 1080p resolution with graphics on the High preset. Performance went from just barely hitting the “golden standard” of 60fps down to 50fps. That’s still eminently playable, but it was a noticeable drop. The smallest performance drop was in the more modern Assassin’s Creed: Odyssey, a game that this eGPU system was already struggling to make playable with the non-recording frame rate hitting 29fps, a point below our definition of acceptable console-level performance. ReLive is great, and in many ways I prefer it to ShadowPlay and GeForce Experience. The Radeon Overlay is more usable and easier to navigate, and if you can’t be bothered to call it up there’s even a smartphone app called AMD Link to activate the ReLive controls instead. The performance is about the same as Nvidia’s software and while ReLive doesn’t have anything original or new compared to other screen capture tools it gets the job done and does it well.